1. Preheat the oven to 180°C (350°F). Line a baking tray with baking paper. 2. Add all the ingredients to a large mixing bowl and mix until well combined. The mixture will be a little sticky! 3. Spread the granola out on the baking tray, in a single layer, about 1cm (½ inch thick). 4. Bake for 10-12 minutes, or until golden. Remove from the oven and leave to cool. 5. 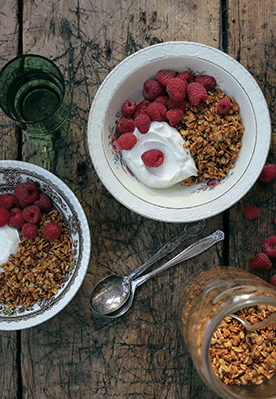 The granola will keep in an airtight container up to 1 month.